* Don’t be scared to try fingerspelling and signing. BSL users are human too! My son is a BSLer and doesn’t speak, we have spent a lot of money trying to communicate with our son which seems morally wrong. * Hearing aids (& implants) are not a cure for deafness, the child is still deaf! * Tip from my deaf son. If you need to get their attention, just touch lightly on the arm. Don’t poke or grab, he hates this. Do you agree with the above? Have you got any of your own? NDCS is going to be sharing these tips with MPs at a parliamentary reception on Wednesday, so please keep them coming in. PS If you’re on Twitter, don’t forget to add the Deaf Awareness Week twibbon to your account and get involved by using the hashtag #deafawarenessweek. As well as through this blog, you can regular updates by following NDCS_UK on Twitter. I spent most of yesterday at a conference by the National Council for Voluntary Organisations – or NCVO – all about campaigns. With such a heavy concentration of campaigners all in one place, I half expected the universe to collapse in on itself. 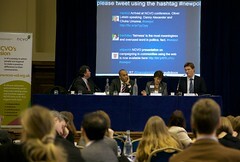 It was all the first conference I’d been with Twitter all around. Behind the main stage was a screen where people in the audience were tweeting their thoughts on the key issues of the day: such as why the vegans in the room were given chicken for lunch and speculating if any of the party manifesto leads might, just for a change, announce they’re standing on a platform of inequality, hopelessness and injustice? Lots of sarky anarachic comments. All of this behind the speaker’s backs. I felt like a naughty school boy. Firstly, the need to make campaigns local and have campaigners on the ground, as a means of engaging MPs and prospective parliamentary candidates as we approach the election. But, also, if future Governments go ahead with greater decentralisation with budgets held at a local level, our key campaign targets are going to be decentralised too. Secondly, the importance of social media. Several speakers spoke about how campaigns had gone from nought to 20,000 followers in weeks via Facebook, Twitter and blogging. There were some admirable examples of how they’d got media attention and putting the Government on the defensive on relatively obscure issues. It means charities have to ‘let go’ in terms of control over messages, etc. but it could result in campaigns have a greater impact. Thirdly, it’s good to take risks, be provocative and stir up trouble once in a while. That message came from Peter Tatchell, who gave a very impressive and inspiring speech about his life of campaigns. He spoke about how his acts of civil disobedience had been controversial at times, but had always been a last resort and had been shown to be successful in changing long-term attitudes. It got me wondering that maybe I need to think more about taking direct action for deaf children when all reasonable approaches to decision makers don’t seem to be working. To the barricades, comrades? A fun day out. Any other campaign trends to watch out for or new ways of campaigning to consider that I’ve missed? Leave a comment below to have your say. I’ve been tweeting for around a month now and still finding my way around it all. But one of the things that I’ve been wondering about is who does the tweeting for the Ministers and MPs who have their own Twitter accounts? Well, my cynicism is ill-founded this time. At Channel 4’s first ever “twinge” at the Labour party conference, Ed Balls said that everybody doubts the authenticity but that he does in fact do all of his own tweets. I don’t quite have the kudos of Ed Balls, but if you want to be in with a chance of a tweet from me, I’m at www.twitter.com/c4dc! Government opens 30 new schools – but do they sound good for deaf children? Yesterday looked like a fun day for the Government; they appeared to be on a Cabinet-wide office day out when they collectively when to visit 30 schools between them. 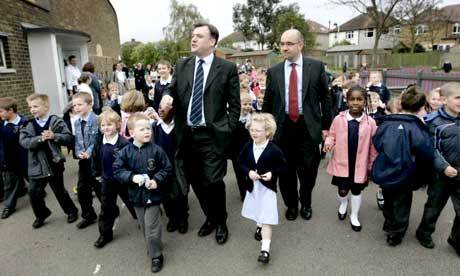 Ed Balls, the Secretary of State for Children, Schools and Families, seemed to cram in around five visits in one day. A man with stamina, or a beneficiary of a secret government cloning programme? I had a bit of fun too, but without leaving my desk. Throughout the morning, I tweeted the various tweeting Ministers to ask them whether the shiny new schools they were visiting were accessible for deaf children and had good acoustics. This was done on a specially created Twitter discussion thread. It proved to be a surprising and direct way to get the Government’s attention and highlight our Sounds good? campaign for good acoustics in schools. Ed Balls tweeted back to say that he would get back to me on our concerns. Another Minister, Jim Knight, also responded. Exciting days as I get to grips with new-fangled technology – Twitter! We have a new twitter account at c4dc. I feel very modern. It all started a while back when we were thinking of the different ways in which people might like to get information about our campaigns – and figured that a system involving short 140 character statements aka Tweets might be an option worth experimenting with for a trial period. At first, I was a bit cynical about it all, and mindful of David Cameron’s views on this. But after a few days, and thanks to some help from NDCS‘s ever patient web-team, I’m now quite enjoying having a little mini-blog to play with. It’s a good opportunity to quickly highlight some of our campaigns work and issues that probably doesn’t merit a full blog. We also thought it might be a good way of getting feedback on things like points we might raise in a meeting coming up or views on a particular controversy. And now I’m merrily tweeting away! The plan is to literally go to town with Twitter at the party political conferences coming up later this month with regular quick updates on who we’ve met, where we’ve been and what we’ve learnt. A way of giving our supporters up-to-the-moment information for those that want it. You can read the tweets via the right hand column of this blog or become a proper follower at c4dc. ‘Campaigning for deaf children’ was too long so we acronymed it to cd4c. Any feedback or suggestions on any other good deaf tweets for us to follow would be great. Enjoy the tweets.